Pre-school and daycare should not prove to be difficult. After that it will get more problematic. Talk to the principal and explain your views. One family alone is unlikely to achieve change in this area. Get leaflets to other parents. Tell them about this website. Tell them about the schools that do allow bare feet. Tell them about the medical research confirming the health of going barefoot. It will be uphill work getting any relaxation of entrenched compulsory shoe policies. As an alternative ... there is always Homeschooling and the Democratic schools. In these cases, you will have no problem at all. Schools permitting students the comfort and health of bare feet were once the norm. 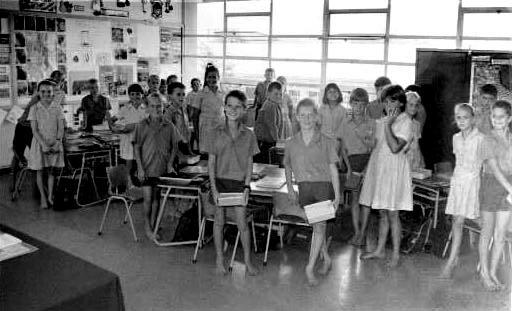 Many such schools still exist in Hawaii, Amish communities, Australia, New Zealand and South Africa (and no doubt, many other places). In general, the tolerance (and in South Africa, encouragement) is much, much more prevalent at the Elementary (Primary) level rather than the Secondary level. To see some of these schools, click here. Seeing is believing. These kids go to school barefoot. They go safely and happily and the sky does not fall. "Children were not born to walk. There were born to run -- barefoot, over rocks, through the water, through the mud. We need to give greater recognition to the energy and joy of children." "Children were not born to wear shoes. In our concern for hygiene and safety, we develop amnesia. Give children a break! Remember how good mud feels between the toes? ".